With great promise, developers announce plans to string high-voltage power lines from Quebec to Massachusetts and bring a new source of lower-cost, clean electricity to New England. They offer millions of dollars to communities and stakeholders along the route to help gain support. But well-organized opposition surfaces and progress stalls. And when a growing revolt against overhead power lines threatens the project, developers belatedly agree to put a portion underground, despite the expense. This chain of events might sound familiar in Maine. These could be bullet points for Avangrid/Central Maine Power’s roughly $1 billion plan called New England Clean Energy Connect, which is being hotly debated. But the sequence actually describes the seven-year saga in New Hampshire involving Northern Pass, the $1.4 billion transmission line proposal that was abruptly rejected last February by a state siting board. NECEC is very much alive, but it’s facing the kind of attacks that ultimately killed Northern Pass. In mid-October, Avangrid/CMP gave in to public pressure and agreed to spend an estimated $37 million to tunnel under the scenic Kennebec River Gorge, rather than string lines overhead. Two weeks later, the company’s stated goal of winning a key permit with the Maine Public Utilities Commission by year’s end vanished, when opponents succeeded in delaying the decision until at least March. Experts outside of Maine who are watching Avangrid/CMP struggle see parallels between what happened in New Hampshire and what’s unfolding in Maine. They wonder what lessons Avangrid/CMP learned from the experience of Northern Pass. And looking at a bigger picture, they wonder whether any major overhead transmission project can gain enough support these days to be built in New England. Bowles, who left office in 2011, was instrumental in setting the aggressive greenhouse gas reduction goals that are the foundation of a Massachusetts law to import big slugs of green power. Both NECEC and Northern Pass, which was proposed by Eversource, the region’s largest power provider, bid into a request-for-proposals competition last year. Both energy companies partnered with Hydro Quebec, the provincial utility, which has pledged to run new transmission lines linked to remote dams in Canada. Northern Pass beat 46 rivals, only to be sidelined by the siting board decision in New Hampshire. That’s how Avangrid/CMP suddenly went from also-ran to top pick. Bowles said he was surprised that Massachusetts and its utility partners pivoted to the Maine project, because it hadn’t secured any permits. In the past, he said, the selection process put more weight on having some permits in hand. That reduces the risk of a project not being built. Last March, Avangrid/CMP confidently predicted it would have all state permits by the end of 2018. The PUC delay makes that impossible now, and a request this month for more information at the Department of Environmental Protection also makes the timeline uncertain. The company continues to say it expects to receive final federal approvals in early 2019, and start construction later next year and be in service in 2022. That remains to be seen. Aside from combating climate change, NECEC promises to reduce future wholesale electric rates. Avangrid/CMP says Maine customers will save a total of $40 million a year, although it hasn’t provided details for that calculation. Bowles said that claim isn’t unique to the Maine project. All New England ratepayers, he said, will benefit from some level of price suppression from any large quantity of Canadian hydropower, anywhere in the region. Experts point out, however, that the current selection process in Massachusetts is weighted in favor of its own electric customers. “At the end of the day, the criteria reflect what’s best for ratepayers,” said John Dalton, president of the Power Advisory LLC consulting firm in Concord, Massachusetts. Projects bidding into the clean-energy competition were scored using a 100-point scale, with the price of power accounting for 75 points. The remaining 25 points reflect values such as development status and overall chances of success, Dalton said. Avangrid/CMP’s initial cost of $950 million translated into an attractive rate for Massachusetts electric customers. Northern Pass, by contrast, was estimated at $1.4 billion, although it has secured most of its permits and promised an earlier inservice date. Northern Pass started out at $1.2 billion. But the project grew more expensive, as public resistance to towers and overhead wires forced Eversource to put portions of the line underground. Outside observers such as Bowles and Dalton wonder to what degree Avangrid/CMP learned lessons from the Northern Pass experience. 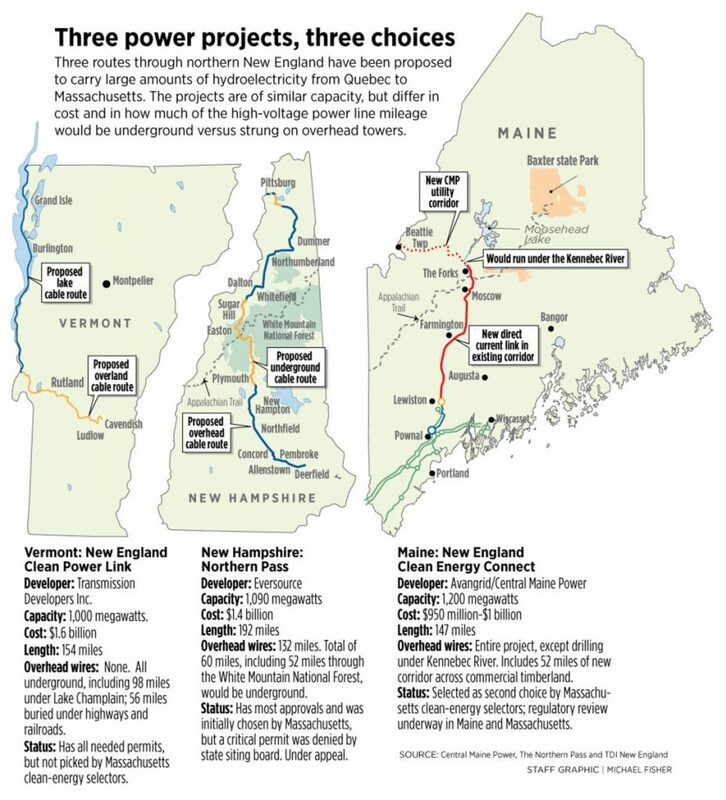 In New Hampshire, Northern Pass first proposed an 182-mile overhead line from the Quebec border, cutting through the White Mountain National Forest. That was in 2010. After conservation groups blocked a planned right of way in 2013, Northern Pass altered the route and agreed to bury 8 miles along roads. Still facing opposition, Eversource again shifted the route in 2015, and planned to bury an additional 52 miles along roads in the White Mountains. Burying high-voltage transmission lines costs more money than stringing them overhead. The difference depends on terrain and other factors, but Dalton and other experts estimate the cost at roughly $5 million a mile. Underground technology also reduces power-carrying capacity, which can make a project less profitable. John Carroll of Central Maine Power and Albert McDaniels discuss CMP’s $1 billion plan to string and bury power lines from Quebec to Massachusetts. 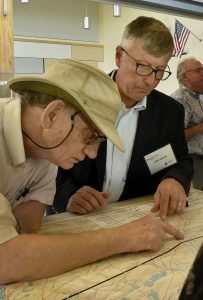 Burying lines was never an option for the 145-mile NECEC project, except at the Kennebec River, according to John Carroll, an Avangrid spokesman. He estimated that going underground would cost five to 10 times more than overhead. Carroll also stressed that the 52-mile crossing from the Quebec border to an existing transmission corridor near The Forks isn’t in a national forest or protected park. It’s commercial timberland that Avangrid/CMP bought from two companies – Seattle-based Weyerhaeuser, which owns more than 800,000 acres of forestland in Maine, and the E.J. Carrier Co. logging and trucking firm in Jackman. This land isn’t bisected by state highways, as is the White Mountains. 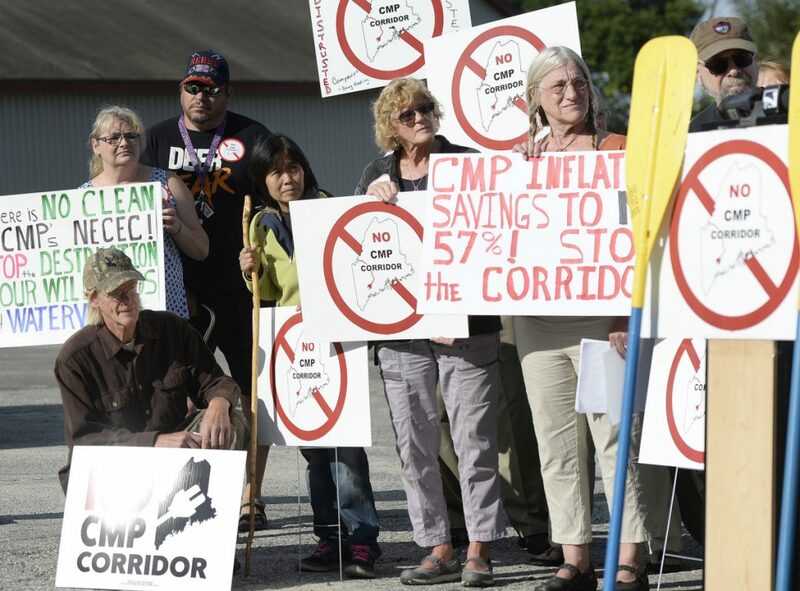 And Carroll said it would be too expensive to reroute the project and bury lines under either of the two highways that connect western Maine with Quebec, routes 27 or 201. But Carroll said Avangrid/CMP did learn a valuable lesson from watching Northern Pass. The ability to negotiate with two large landowners and not dozens of smaller ones also gave the company flexibility to design a 330-foot-wide corridor that is efficient and minimizes impact on the environment, Carroll said. “Building a line like this anywhere else in the New England would be inconceivable,” he said. Maybe so, but it is possible to design a project that can bring a comparable amount of power from Quebec to New England, with no overhead wires. A proposal called New England Clean Power Link also bid in to the Massachusetts competition. The 154-mile transmission line would run entirely under road and railroad rights of way in Vermont and under Lake Champlain. Two, 6-inch-diameter cables would be trenched 3 feet under the lake bed. On land, they would be buried 4 feet deep along highways and rail corridors. The Power Link project has received all permits, has support from leading environmental groups and has agreed to pay more than $370 million over time for lake restoration, clean-energy development and other benefits. The $1.6 billion project wasn’t chosen by Massachusetts, however, apparently because its power would be more expensive than Northern Pass or NECEC. Jessome points out that all three projects are merchant lines – that is, they’re being developed for clean-energy goals and to make money for Hydro-Quebec and their builders. They aren’t so-called reliability projects; they’re not needed to keep the lights on in New England. That’s why his team decided from the start to go all-underground, he said, and offer robust financial incentives to gain support. In Maine, Avangrid/CMP has touted property tax payments and construction jobs in its attempts to gain support from towns along the route, with mixed results. It also signed an agreement with some rafting, tourism and recreation interests in western Maine, an action that failed to win over detractors. Northern Pass offered what it called the Forward NH Plan, promising $200 million for economic development, tourism and clean energy. But the money seemed like a bribe to some. That sense was amplified last year when Maine ski-area developer Les Otten, who’s currently redeveloping the Balsams Resort in New Hampshire, acknowledged that a $5 million loan he got came with an agreement that he testify in favor of the power line before regulators. Savage said he faults the process in Massachusetts, which favors a large, low-cost solution rather than smaller, local projects. But Carroll at Avangrid/CMP said clean energy has to be affordable, if politicians and consumers are going to embrace it. Running transmission lines through commercial timberland is a way to meet that goal, he said.